Apart from their extremely high cut resistance, Gator Grip gloves from Blackwoods are specifically designed for getting a solid grip on oily tools or lubricated parts. Aptly named to imply the relentless grip of an alligator, these work gloves feature a massed surface of tiny guard plates in the palm which bite through and channel away lubricant in the same way “snow tyres” cut through an icy surface to grip the road beneath. This allows the user to latch tightly onto those slippery surfaces commonly encountered in the oil & gas or similar industries. But in addition, the Gator Grips Gloves’ palms have a lining of SuperFabric material to provide the highest possible cut resistance (exceeding EN 388 Cut Level 5). 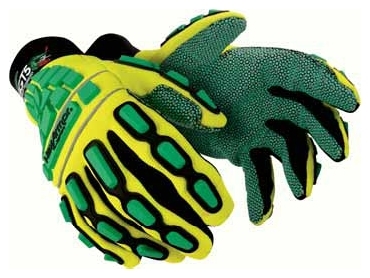 Brightly coloured for high visibility signaling and with powerful impact protection to prevent back-of-hand contusion or crush, the industrial gloves are machine washable and can be tumble dried.